Ed how do you disable annoying enemy reinforcements, coming by two enemies after some minutes in sector. Very annoying. I see something in .ini under strategic gameplay settings but idk what the options mean. Edit: ok the options are pretty self explanatory when you read all of the description. You found what you were looking for? Enemy reinforcement will arrive minimum this number of turns after they are called, if 0 then is disabled. Yeah i found it, it was very anticlimatic when each turn only two or one enemy appeared. Ive just killed them as they appeared. Now ive returned to vanilla settings, so at once will appear 8 to 17 enemies. Ed, Bofors AK 5b can't attach Rifle LAM despite saying so. Ive checked files and everything looks alright. The small laser can be attached, but not rifle LAM. Yes i've checked if its off or on, the same Rifle LAM attach to other weapons. Edit: Ok, just a simple fix by adding necessary lines to attachements.xml . Forgot that Rifle LAM On and Off are a different items. There was a missing entry in .xml for Rifle LAM On. Also i would like to see a molle pouch that adds general large space. Thanks for the heads up on the Rifle LAM & Ak 5b. A big molle pouch - can do! General Large, or something that can store RPG rockets. I find RPG pack quite useless, since its only three rockets, and you can't attach it, can't bring another backpack along with it. Had a problem with Fatima. I got attacked after I gave her the letter but before I moved to next sector. After the battle Fatima walked past Dimitri. Dunno where she went. Loaded the game and talked to Fatima after the battle. Worked as it should. Also in Drassen game got stuck on enemy turn. I tried few times from different end turn saves. I´ll try an earlier save if it goes through. I need a save just before the bug. Hmm. Not sure if I have it. I`ll check. I made a new fresh install because old one was updated from previous versions of Vacations. So far no problems. I noticed one minor thing, some civilians are talking "quote 11" and "quote 4" in Drassen airport. But no problems with freezing. In my AV game, version 688 + AI, can i replace the exe with the regular 7609 ? Current exe is also 7609. That +AI is putting me off. Or is there a setting somewhere to increase how much the CTH bar fills up while adding aimclicks ? I am playing this to experiment with the new mercs, always nice to try out new blood It would be great if someone could give me a few pointers ! In my AV game, version 688 + AI, can i replace the exe with the regular 7609 ? Yes you can, Ja2+AI is 7609 compatible, but starting new game is recommended. Thank you Sevenfm for verifying. I was definitely thinking to start a new game. How do i go about it ? I am thinking to extract 7435 + 7609 in a separate folder, then copy/paste in the existing AV folder to overwrite the existing exe. Please advise if possible ! Thank you Sevenfm for verifying. I was definitely thinking to start a new game. How do i go about it ? I am thinking to extract 7435 + 7609 in a separate folder, then copy/paste in the existing AV folder ? Please advise if possible ! You should have 7609 ja2.exe in your AV installation folder, just run it instead of Ja2+AI. Looking at the AV folder, i see 3 exes. JA2, UB and 7609en+AI. Nothing else. I am always entering the game from the INI.Editor. I see no other exes. Could you please give me some detailed instructions on how to replace the AI exe ? 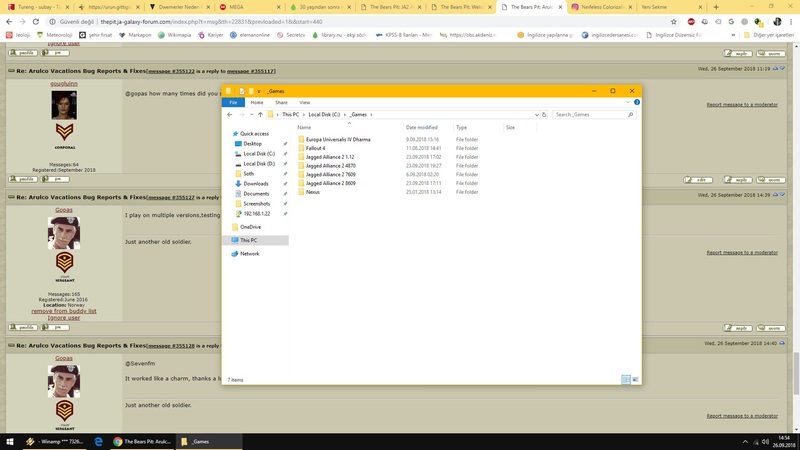 Am i missing files ? Should i download the latest AV version instead ? Or should i just replace the AI exe with the stock 1.13 7609 ? I am not sure that it will still be AV if i do this. When the game starts, you will see if it's correct version. I play on multiple versions,testing things out, kind of a hobby with me. It worked like a charm, thanks a lot sir ! Nice mod, really interesting. I like the custom portraits which are awesome, as the gear selection is. I like to play various mods to see what's in them (like unwrapping a gift, lol) so far I'm really pleased. I have a bug with this mod when talking to Devin though, at clicking 'buy' just about where his inventory is to show the game freezes. I've installed the mod Arulco Vacations on top of the latest Ja2 1.13 build; Rev: 8633, GD: 2449 (had that one available at the time of install) the mod works without errors, at least up to the point of wanting to buy something off Devin, but the inventory of the barkeep still works normally though, so that's what I wanted to report. After installing the old installer, it seems that the bug is also persistent in build: 7435, with update version: 7609. Keep up the good work, and good luck to ya. Thanks for the kind words, i'm glad you enjoy it! I'll pass your comments on to the portrait artist. I'm trying to figure out what is going on with Devin. No luck so far. But I will have it fixed for the end-of-year update. Awesome, don't sweat it. My notion at first was that this was related to the store menu UI, but I'm not sure since I don't know exactly what I'm talking about here. But if we know about a bug ea; if it's documented then I think we at least can know what to know, or at least what to expect if you know what I mean. Time then is not really of the essence knowing what the problem is and knowing that it will be fixed one day. This than sort of works like a soothing factor. Encountered the same problem with Devin but i don't really care about his wears. In general, i prefer to order from Bobby Ray or collect gear and items from drops. However, i am wondering whether will i will be able to recruit him or not but again, it's not a big deal. So, the game freezing when we try to buy from Devin it's not an isolated case. Slay's triggers need to be checked as well. I don't know if anyone else has problems with trying to recruit Slay. Interesting. Thanks for sharing. Just to put my thoughts in, I won't spam much more after this, I think. I thought that I had a bad installation of the mod, even though I had followed all the instructions and applied all the logical steps that I've learned along the way with the way that for instance the file system is handled. Well, I did everything except install mod in the correct 1.13 version (I used the latest), so I also thought this was related to the freeze. This doesn't luckily appear to be the case. As I've estimated it would be. To me the experience has become more about exploring the game, being engaged in combat.. Selling and buying stuff like various gear. Using the gear. Slowly exploring the story. I'm really early on in the story of Jagged Alliance 2 (yes I'm an overall noob to the game) but I feel it somewhat a pity to rush through the storyline because the game is one of those rare, epic and immersive experiences they just can't seem to duplicate anytime. One more word about the bug, this one in particular (freezing events): these things tend to happen with certain scripts across the board in various mods where something was supposed to happen but doesn't for some reason making the game hang. Sorry about that - it is fixed in v1.11 which I am very soon to release. You can use the MapEditor (manual is in the Docs folder) to fix the teleport coordinates, or you can download the map fix I did here. Simply unzip into your main game folder overwriting all files (if no files are overwritten then it wasn't unzipped in the correct place). Sorry Ed. I still can't download your fix from Mediafire (have tried on 3 different browsers/ with and without VPN). Would you mind just attaching it to a post or uploading to a different host? OK, here it is, I hope (never uploaded a file here before). It would only allow certain file types so I had to change the file extension to .pdf - you'll have to rename the file with a ".zip" extension. I can now enter the San Mona mine sectors but when i exit the mine I am teleported to sector A1 tropical in Chitzena. Hmm. Well, at least you're not lost! :-) Happy New Year! I'll fix that, thanks. EDIT: It seems the Map Editor is very, very touchy with teleport coordinates - overwriting them with whatever values are in the boxes if one goes to simply check them. In short - it seems you can never check the teleport coordinates, only edit them (as checking them automatically edits them). drasen sam site e.s have fnc ar but ammo for springfield 1903 rifle .. Yes! I had the same problem when trying to manually edit the teleport destinations. Very confusing. I thought I was doing something wrong but it seems like its actually a bug with the map editor. HNY to you too! I especially like the ability to recruit some new characters from Alruco. I used Brenda (jacked up on Cocain, Barrage and Stim, ofc) to win the ultimate fighting tournament . I noticed that the 'Ray's guns' shop in San Mona actually has a much bigger selection of weapons than Bobby Ray's online store, but that he cannot buy weapons only sell them. Is this intentional? Another thing I can't quite work out is how to use the covert-ops disguise feature. I have a spy IMP and Elroy from MERC but even when I equip them only with a concealed pistol and civilian clothes, the little hat icon indicating they are disguised doesn't appear next to their portrait, and the enemy still turns aggressive the moment they see them. Do you think giving Maria the covert-ops skill might be fun? (Since she is on the run from Kingpin's goons and probably would need the ability to hide her identity). Speaking of goons, The 'gangster' faction has soo many more members in and around San Mona that I have no idea how i'm going to take out Kingpin like I normally do when the time comes. I also have a radio operator equipped with a radio set(with battery) but when I try to assign her to radio scan the option is always greyed out. Am I missing something? Maybe this is not particular to your mod, and i'm just not using these two features correctly? Another thing I noticed was then I alt-hover over enemies or NPCs I get ALL the info about that character including a bunch of stuff which looks like it should be related to AI and/or other internal workings of the game. Wasn't sure if you had enabled this by default on purpose. Yes, AV is a bit more deadly. Combat is kinds warped in v1.10 as I tried something that didn't quite work. In v1.11 I've merged the SDO system with mine so combat will be a little different in v1.11 - but still more deadly than vanilla. Brenda is one of my favorites also. I have plans to enable more locals to be recruited. I am not that conversant with the covert ops feature - I know Sevenfm has worked on it, perhaps he can help here. It might be. Too bad there wasn't a way to learn skills. I'm doing a bit of rework on San Mona right now - the last bit before release, I hope (fingers crossed). The radio has to be worn as a backpack, and when you call up the menu (using "$") the mouse cursor has to be within the tactical map borders. If it's outside the map the menu remains greyed out. Yeah, I use that in my playtesting . . . and always seem to forget to switch it out.